At 18:30 while deploying Thunderer did not open fire. She was at the rear of 3 ships. 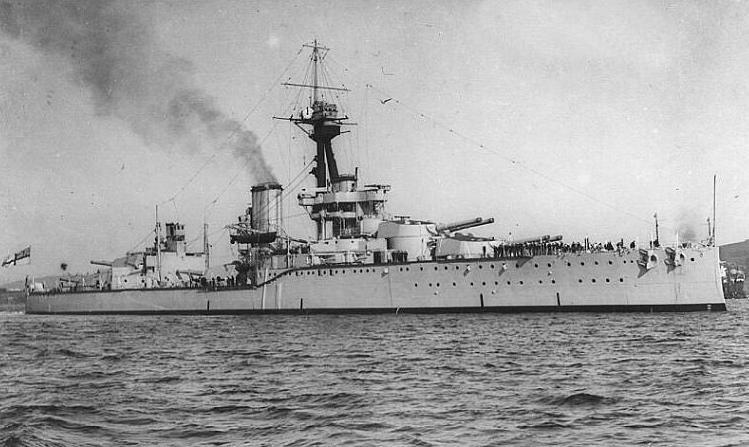 At 19:15 sighted enemy ships between Iron Duke and Royal Oak. When she opened fire, she actually fired over the Iron Duke. At 22:40 Moltke managed to get past the four Orions without being challenged or fired upon.Only fired 37 rounds of CPC. No secondary gunnery was used. 4 Parsons team turbine engines heating 18 Babcock and Wilcox boilers driving 4 shafts. Rated at 27,000 shp. 4 armoured decks - upper and main 1.5" and lower 2.5"
11" fore and tapering to 3"
Single tripod to only carry a small extension mast to use for the radio antennae. First ship to carry Percy Scott&apos;s Director System. She scored top in the 1912 Firing trials. But the tripod was set behind the fore tunnel consequently very often blacking out view from the Conn as well as often making if difficult to work with the heat and fumes.The problem was only half solved with the fore tunnel taking steam from 6 boilers while the aft funnel took it from 12. Barrels wore out after 450 rounds.